Fitzroy Island is a 45 minute ferry ride (about 30kms) from Cairns in Queensland, and is surrounded by a reef system that forms part of the Great Barrier Reef Marine Park, making it the perfect accessible base for snorkelling, diving and exploring the reef. Idyllic white sandy beaches lead into the safe, sheltered waters, which are also ideal for swimming and water sports as well as yachting and boating. (originally Koba or Gabar) is a continental island out from Djujbirri (formally known as Cape Grafton), 29 km south east of Cairns, Queensland, Australia. Fitzroy's isolation has resulted in a unique habitat, with few large mammals. The dominant predators on the island are reptiles; particularly pythons (brown and green), monitor lizards and the Major's skink. The latter of these is particularly common and will be seen frequently as a tourist wanders around the trails. There are no venomous snakes on the island, though python bites can become infected. 4/3/2011 "Nice and secluded, but there are still jellyfish concerns when swimming. Great nature trails to walk around. Bring your own snacks, drinks and groceries, as options are limited"
The only way to reach the island is via ferry boat transfer from Cairns, located at the Reef Terminal. There are two ferries that operate, both leaving in the morning (before 10am), and returning around 5pm each day. 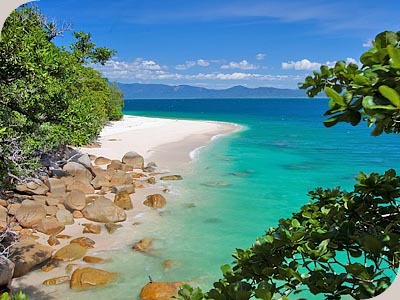 History: Fitzroy Island is a continental island, not a coral cay. It became an island when sea levels rose at the end of the last ice age, flooding a plain between a hill that is now Fitzroy Island, and what is now Cape Grafton. Over the 10,000 years since that time, coral reefs have formed in the bay on the protected western side of the island, and lush rainforest on its shore. Fitzroy Island has been put to many uses by humankind. 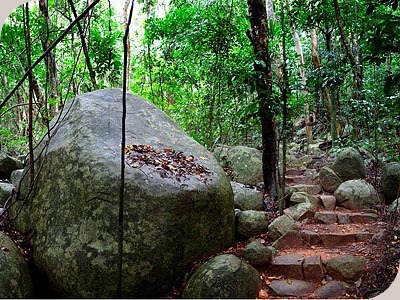 It is part of the traditional lands of the Gurabana Gungandji people, who recorded its formation in myth, and was used as a hunting and fishing ground. In 1778, Lieutenant James Cook named the island after the family name of the Duke of Grafton, who was the British Prime Minister when his ship, the HMB Endeavour, had set sail. Through the 1800s, a pearling and beche-de-mer industry operated from the island. A giant clam research station remains in operation on Welcome Bay. The Island has also served as part an aboriginal mission in the early 1900s, an artillery gun emplacement in World War II, and, more recently, a tourist resort. The Island has also been home to lighthouses warning ships in the Grafton Passage of the reefs around the island, and a small automatic light on Little Fitzroy Island, just off the north-east point, still serves this purpose. An inactive lighthouse sits on the point above, and is part of the circuit trail that is open to tourists. Immunization: No shots or immunization is required.